This is the debut album by the young Polish Jazz pianist / composer Michal Wroblewski, recorded with his trio with bassist Michal Jaros and drummers Michal Bryndal and Wojciech Romanowski. The first version of this album was recorded by the trio with Bryndal and released as a promo. This, the final version of the album adds four more tracks recorded by the trio with Romanowski. Since both trios recorded the title track, the album's nine tracks are in fact only eight distinct compositions, of which five were composed by Wroblewski, one by Jaros, one is an interpretation of a John Coltrane tune and the title track is a contemporary house composition, which proves that Wroblewski listens to other music than Jazz as well. Both trio sessions were recorded at the legendary Studio Tokarnia, with Jan Smoczynski behind the knobs, which is always a guarantee of superb sonic quality. The Polish Jazz scene seems to be an endless source of excellent piano players over the years, and the contemporary scene, which hosts both the veterans, the middle aged and the young pianist is simply exploding with talent and activity. 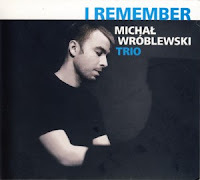 Wroblewski is certainly one of the interesting newcomers, who still have to pay the dues and put forward their accomplishments before achieving an honorary position on the pedestal reserved for the Polish Jazz piano giants. Judging by this recording he's certainly on the right track, as the music presented on this album is quite excellent, both from the point of view of the performance and the compositions. Both trios play elegantly and display individual skills as well as an ensemble spirit, carefully listening to each other. The compositions present a nice balance between the melodic themes, rhythmic progressions and harmonic structures, which are ideal vehicles for the improvised passages. There is a frequent usage of Classical quotes and neo-romantic mannerisms, which are probably mostly sub-conscious and quite understandable considering the pianist's age.